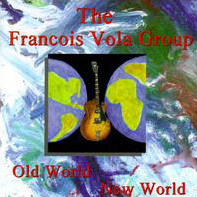 Using a simply laid-out combination of world beat and american folk acoustic textures, French guitarist Francis Vola offers lovely, timeless melodies on his Old World, New World (RDC Records FVG-1002; 59:58). Vola’s six piece band crafts a lively, jangling acoustic sound to augment melodies like “Mambo Jambo,” with its interwoven Latin rhythms” and “Occitania,” a lean brasil-feel walk accented with violin. Vola’s intricate, warm leads spread joy on “Oliver,” which swings with sophistication and authority,” and meditate over the dark waltz texture of the album’s title track. Vola’s straightforward arranging also renders pathos through the melancholy, dissonant chords of “For All the Poor Children.” The simple, elemental approach taken by Vola (now a resident of small town Hickory, North Carolina) utilizes classic forms to touch the heart.